Solar UK’s LaZer2 Solar Tracker has been specifically designed to offer UK and Northern European households a cost effective and enviomentally friendly way to heat their swimming pools throughout the year. By continuously tracking the sun you almost double the amount of solar energy absorbed by a similar sized fixed solar water heating system. The Solar Tracker will either integrate seamlessly into your existing pool heating system, or form part of a new installation. If you only use your pool during the summer months, by the flick of a switch, the heating can be diverted to your domestic heating system and you can save money on your household hot water bills as well. 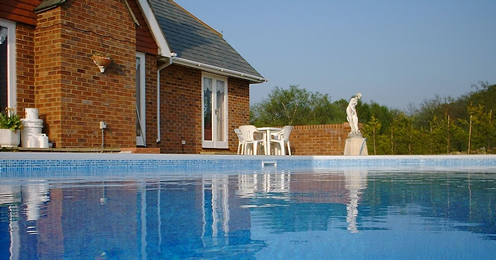 The average pool requires a single eight-panel tracker either mounted on the ground or on a flat roof to meet the majority of its water heating requirements. If you have a larger pool or require the water at a higher temperature then our modular system can be easily scaled up to meet your needs. If you would prefer a fixed, static system then you will probably be interested in our LaZer2 Solar Hot water System.